Mumbai: Indian Oil Corp. Ltd, the nation’s second largest refiner, turned to a profit in the second quarter after crude prices fell from a record, reducing losses from selling fuels below cost. Net income in the three months ended September was Rs284 crore, compared with a loss of Rs7,050 crore a year earlier, New Delhi-based IndianOil said in a statement to the Bombay Stock Exchange on Friday. The median estimate of 14 analysts surveyed by Bloomberg was a profit of Rs2,120 crore. Net sales fell 18.6% to Rs6,079 crore. 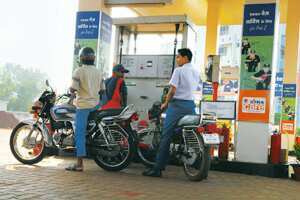 There’s been a reduction in losses on sales of gasoline and diesel, Niraj Mansingka, a Mumbai-based analyst with Edelweiss Capital Ltd said before the earnings were announced. IndianOil is investing in new projects and that will help bring in additional money. IndianOil shares fell 1% to Rs311.40 in Mumbai trading, the lowest level since 11 September The refiner said a fire broke out at a storage terminal in Jaipur in western India late on Thursday. State-run IndianOil, which sells fuels below cost to help curb inflation in the South Asian nation, is partly compensated by discounts on crude bought from state-producers Oil and Natural Gas Corp. Ltd and Oil India Ltd. The government also gives state refiners bonds. The refiners didn’t account for any bonds in the second quarter, Narasimhan said. Bharat Petroleum Corp. Ltd, India’s second biggest state refiner, and Hindustan Petroleum reported losses in the three months ended September. IndianOil earned $3.62 for every barrel of crude it turned into fuels in the quarter compared with a loss of $4.07 barrel a year earlier. Loss of revenue from selling auto and cooking fuels below cost declined 15.7% to Rs4,175 crore, Narasimhan said.